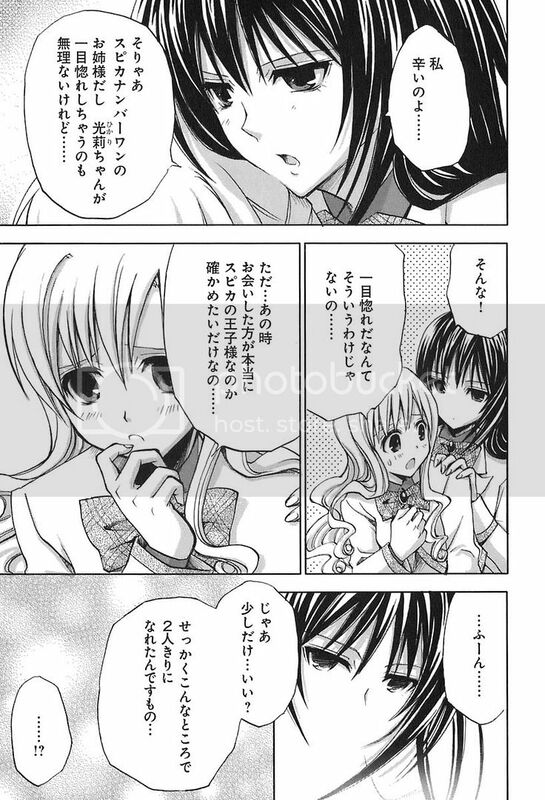 In Chapter 3 of Strawberry Panic!, 'The Secret Garden', Shizuma tries to manipulate Nagisa into joining the Etoile Battle with her but Nagisa doesn't seem to be listening lol. Nagisa noticed a castle-like building a distance away and wanted to take a look. 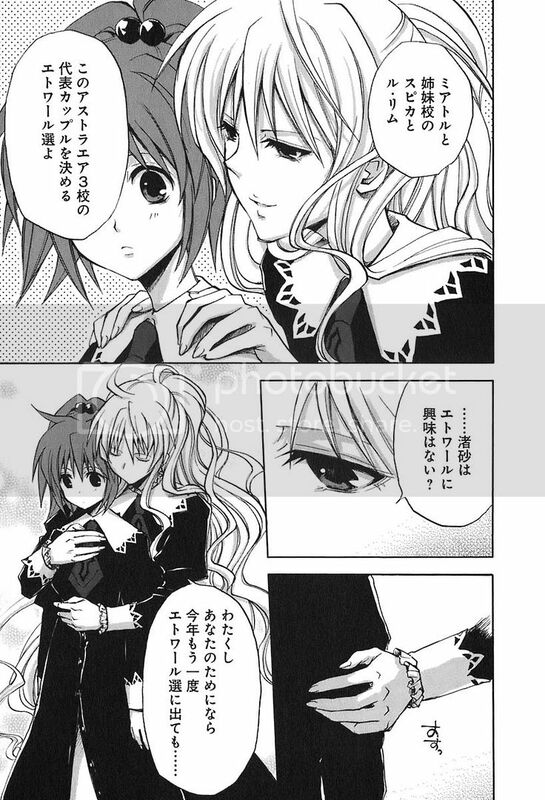 Shizuma got excited and was glad to bring Nagisa to 'The Secret Garden' fufufufu. The Secret Garden is none other than the St Miator's Library. 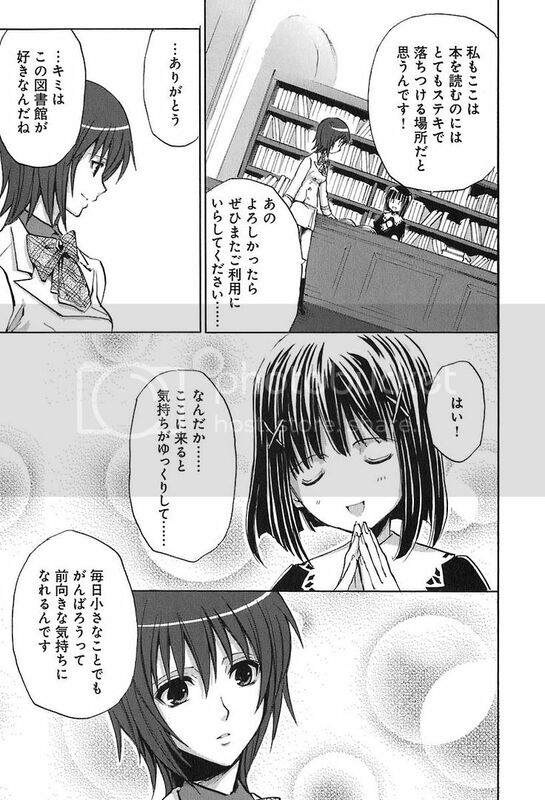 In the library, Ootori Amane, the Prince of St Spica was there reading. But Amane was watched by fangirls from St Miator and they were too shy to approach Amane, only contented to watch from afar. Amane knew the fangirls were looking at her, after she finished, she got up and looked at them. The fangirls frantically pretended to be reading lol, annoying Amane a little as she wished that the girls won't be that nervous around. 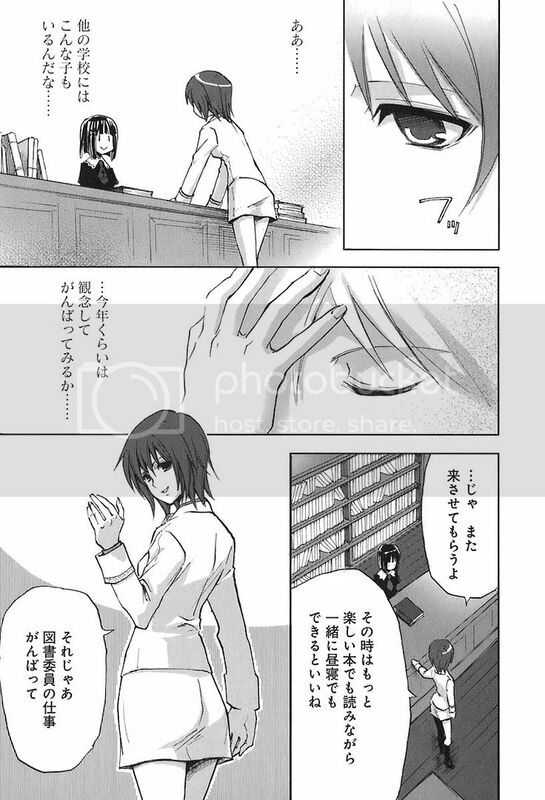 Amane got up to the library counter and asked Chiyo who was on duty to place back the book she borrowed. Chiyo explained the reason why the book that Amane borrowed could not be borrow out was because there were pictures of last year's Etoile Battle winners in it and inconsiderate girls had tried to tear it out lol. 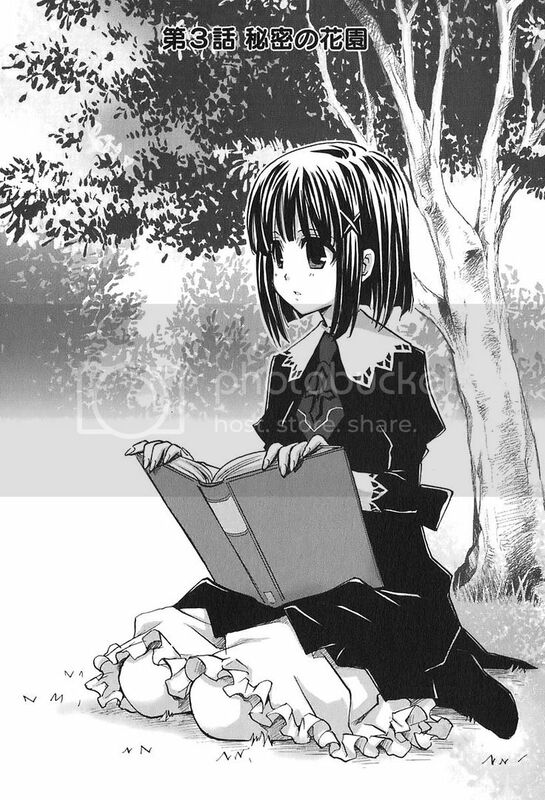 Amane commented that St Miator's library's really quiet and peaceful. Chiyo agreed and was happy that Amane finds it that way. 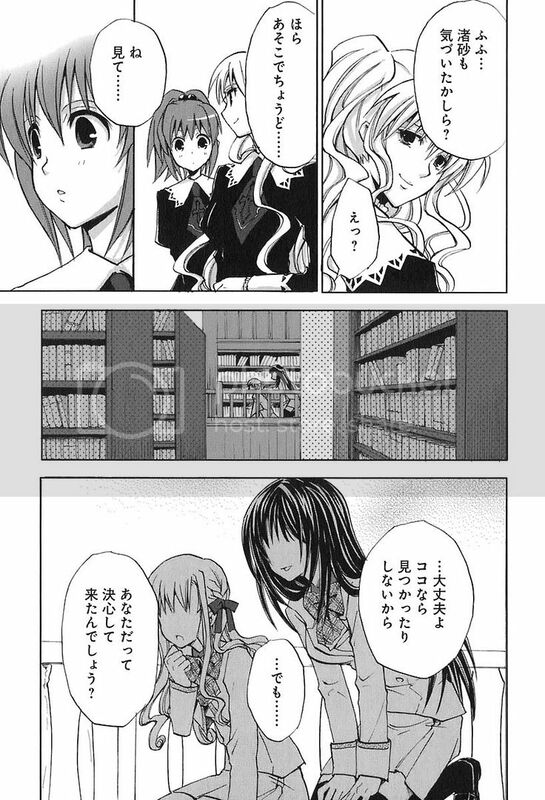 Amane was surprised at how Chiyo enjoyed being in the library and asked for her name. After getting Chiyo's name, Amane commented that it's beautiful and introduced herself. Chiyo smiled and replied that she knows Amane because of her popularity. Amane realized that she's not going anywhere without anyone not knowing her and decided to do her best then. Amane told Chiyo that she'll come back sometime soon and left. After Amane left, the fangirls bolted out from their hiding places and began harassing Chiyo lol. 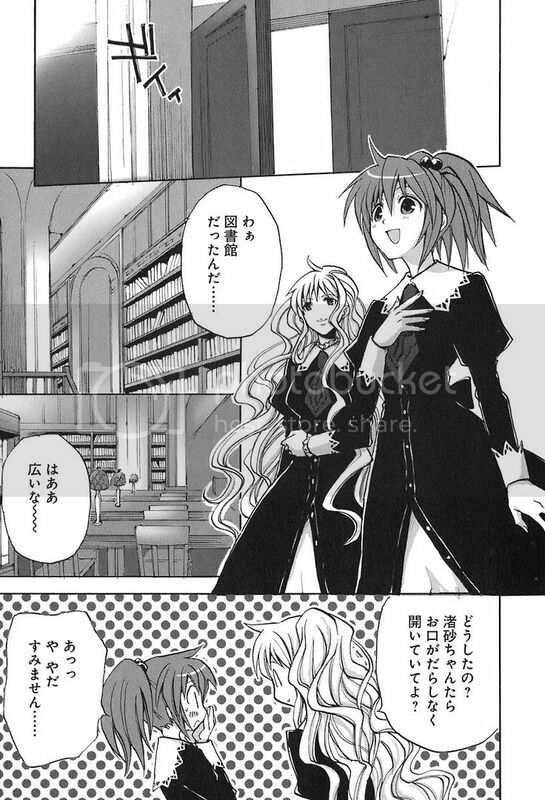 Meanwhile, Nagisa and Shizuma arrived in the library and Nagisa was amazed by surroundings. 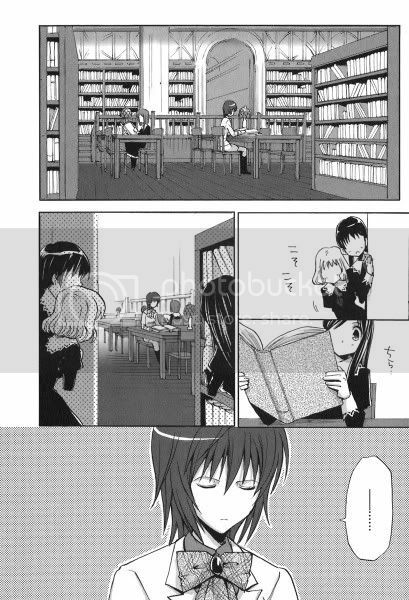 Shizuma lead Nagisa deeper into the library [Fufufufu] and along the way, Nagisa saw a couple of girls getting pretty intimate. Nagisa felt that she was engulfed in some silent but heated excitement. 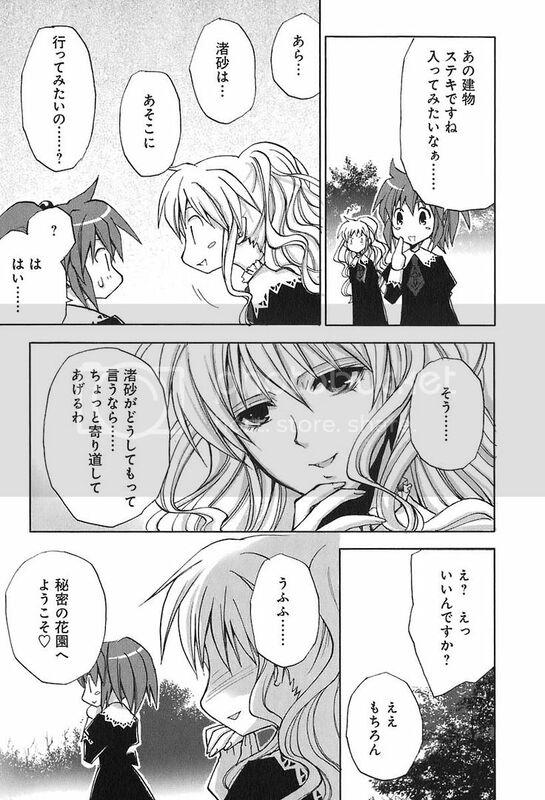 Shizuma smiled and realized that Nagisa felt that too and told Nagisa to take a look at two St Spica girls in a corner. The girl with long black hair's Nantou Yaya, 4th Grader and the blondie's Konohana Hikari, also a 4th Grader from St Spica. Yaya assured Hikari that they won't be seen from here but Hikari's still worried. Hikari wanted to see if Amane is the one she's looking for. Looking at Hikari so conveniently in front of her, Yaya placed her hands on Hikari's shoulders and said she wanted Hikari to know her feelings too. Hikari's surprised at Yaya's actions. Yaya pouted and said she's hurting as her rival in love is the great Amane-sama ... it's no wonder Hikari would fall heads over in love with her. Hikari protested and said she wasn't in love with Amane-sama ... she only wanted to see if it's really the Prince of St Spica, Amane who saved her. The girls from St Spica make their first appearances ... and I say, they really did make a huge impact ... especially Hikari and Yaya lol. If you think this is hot, try Chapter 5 lol. But before that, Chapter 4 tomorrow ne? Will Nagisa crumble under Shizuma's expert touches?